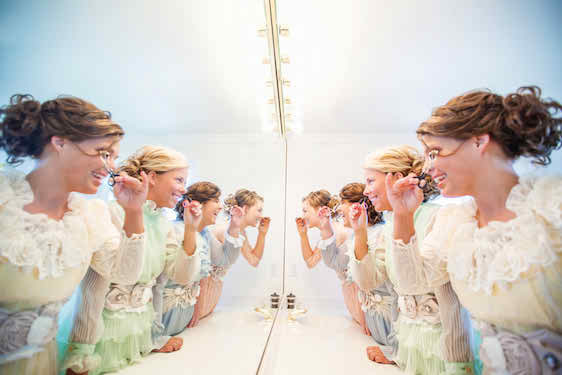 Lauren and Zach had the sweetest, vintage inspired wedding! This old soul couple had all things vintage and historic at their beautiful wedding. Darling DIYs could be found around every corner. And this couple made sure to incorporate lots of heartfelt touches throughout as well. Captured by Watson-Studios, the ceremony was held outdoors at Boone Hall Plantation and Gardens which is a historic site in Mt. Pleasant, South Carolina. The gorgeous, and picturesque “Avenue of Oaks” made the drive into the venue absolutely charming. Some of the sweet details you'll want to be on the lookout for: Lauren’s vintage birdcage veil and brooch bouquet, the cutest bunch of bridesmaids you'll ever meet, handcrafted table numbers, beautiful vintage china. Oh, and did I mention the church doors that they used for the ceremony? What a darling entrance into an outdoor ceremony. Let's take a peek, shall we? 3 Comments " A Sweet Southern Wedding Under the Oak Trees "
Those Plum Pretty Sugar dresses are so lovely! The dresses and colors are so fun!